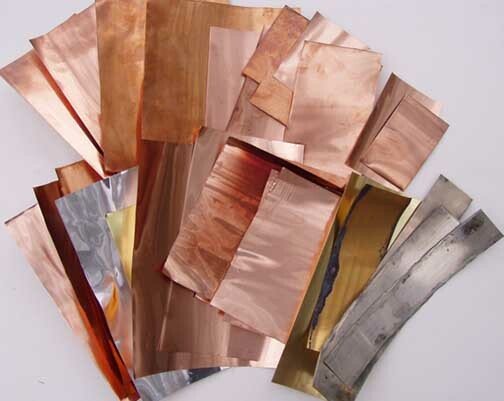 Cutting copper and brass is easily done if the proper tools and techniques suited to the gauge of metal being cut are employed. Care should be taken in that cut edges of metal are sharp. Wearing gloves is a good safeguard against getting cut on the metal's edge. 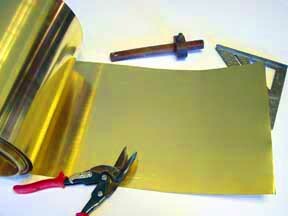 Thin gauges of sheet metal such as 30 and 36 gauge can be cut using a standard household scissors. 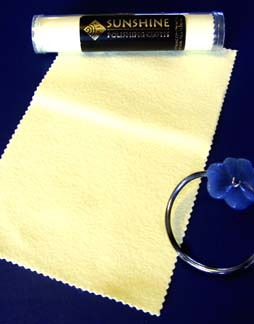 The edge of the blades will dull slightly so don't use the pair that you would normally reserve for fabric. It is possible to cut straight lines as well as circles and intricate shapes by gently flexing the metal out of the way as the scissors cuts, just as you would in cutting heavy paper. Intricate shapes or interior cutting can be done with a utility or Exacto knife. 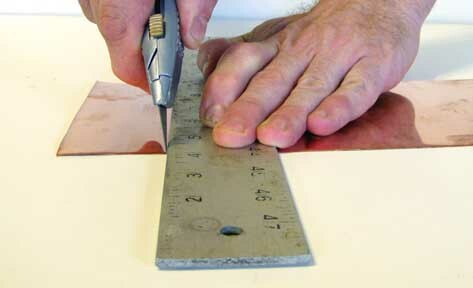 Long straight lines can be cut using a utility knife guided by a metal straight edge or ruler. Use a lot of pressure to hold the straight edge in place. A new, sharp blade in the knife works best. 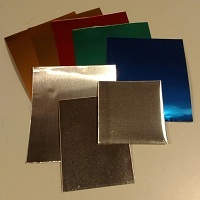 Two or three light passes yield a better result than a single heavy pass on thin (30 & 36 gauge) metal. 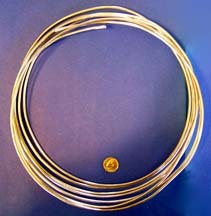 Heavier gauges (23 gauge) require three or four 'heavy' passes. 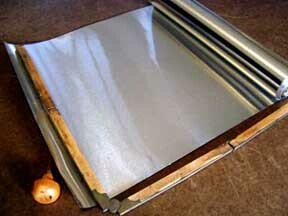 The metal will either separate on its own or will 'snap' at the cut with some gentle flexing. Circles and curves are most easily cut in heavier 23 gauge sheet metal with OFFSET METAL SNIPS (also called an 'AVIATION or 'TIN' SNIPS'). Tin snips come in a couple of forms and colors. The most useful snip (pictured at right) have cutting blades that are rounded and tapered to cut in either a straight line or a counter clockwise curve. The green colored version of the same snips cuts straight or in a clockwise curve. The yellow version is purported to cut in a straight line. Tin snips also come in an elongated straight blade form that is useful in cutting strips to length. Tin snips can be found at hardware and building supply stores. The best snips to start out with is the red offset cutting one pictured above with the tapered and rounded blades or the equivalent. The handles are offset to keep hands above the work. Red handled or 'left' snips do cut somewhat to the right. If an acute clockwise cut is required, the metal can be turned over. Sharp curves may require that the sheet metal being cut away be gently bent and guided up and over the jaw of the snips as you proceed with the cut. 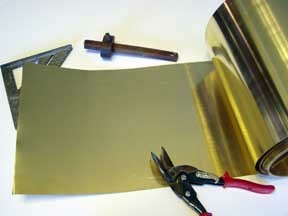 When cutting sheet with a snips sharp and jagged edges may be presented that need to be sanded. With a little practice you can cut without jagged edges. 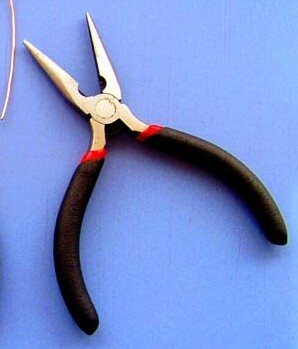 NEVER CUT WIRE WITH THESE SNIPS AS IT WILL RUIN THE SMOOTH CUT. Also an excellent snips is the Sears Craftsman Snips #9-42716 or Sears item #00981985000 . The Wiss' M1R work very well and have longer pointed blades. Wiss' M6R works OK, but the blades are short and blunt, making it less effective for intricate cutting. Stanley and Irwin are two other snip manufacturers. 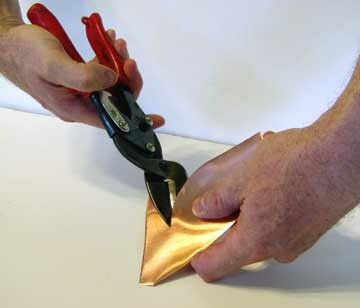 For thin sheet metal scissors can be used to cut 30 and 36 gauge sheet. Some paper cutters work as well. 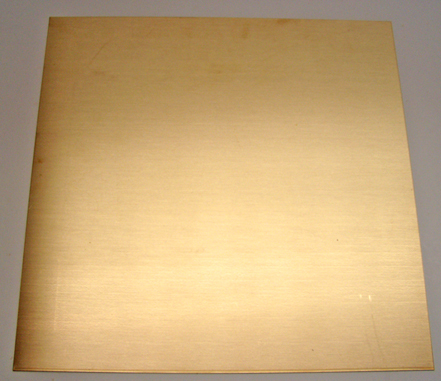 Holes can be punched in this thin metal using a paper punch. 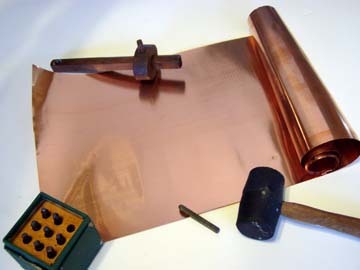 Leather hole punches can be used on 23 gauge copper and brass. A sharp electric drill can also be used. PRECAUTIONS must be taken as the drill can snag and spin the sharp metal. The piece to be drilled should be clamped or held firmly with a pliers or vice grips. 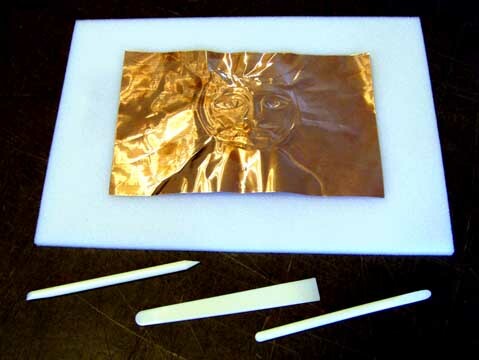 Holes in very small pieces should be drilled before the piece is cut from the larger sheet. Large diameter holes should always be started with a smaller 'pilot' hole. Eye protection is essential. 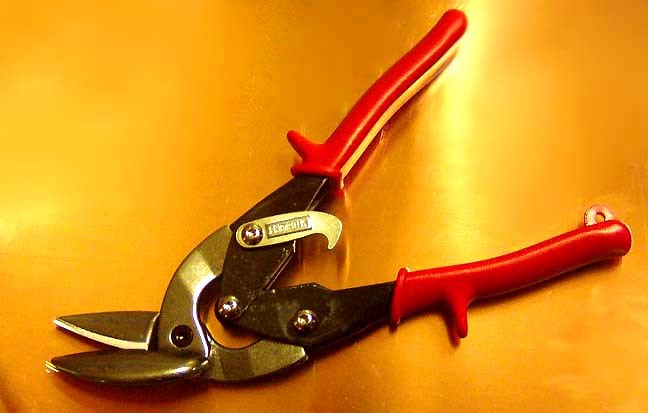 Irregular openings or large holes can be made by enlarging the drilled or punched hole with the tin snips. Very intricate designs in 23 gauge copper can be cut out using a jeweler's saw with drilled starting holes. 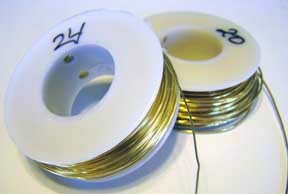 Cutting wire can be done simply. 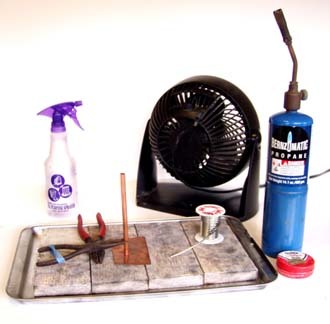 A heavy wire cutter as shown above for thick wire & a lighter wire cutter for fine wire. 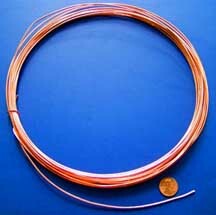 Wire can also be cut with a saw. Either way sanding and rounding the ends will produce a more finished look to any project. Aluminum wire cuts easier than copper , nickel or brass of the same gauge due to its lower density. Use caution when using any tools. 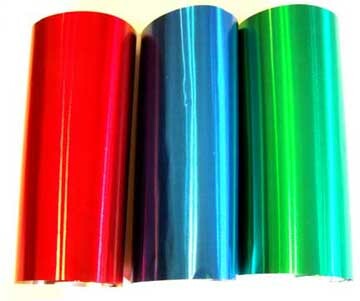 They are not for use by children.